Chance for a Kirklees child to win £1,000 cash prize! Today marks the launch of education activist Just Enough’s Children’s Award. They are looking for head teachers to enter pupils into the competition. Within the Kirklees area Just Enough has reached over 300 children through their workshops. Just Enough takes a unique approach to educating primary school children on the challenging social issues the next generation are growing up with. The organisation goes in to primary schools and runs workshops on topics including: Modern Slavery, Hate Crime, County Lines, Anti Radicalisation and Knife Crime, helping schools and young people to understand and tackle these, not issues you would typically associate with primary education. 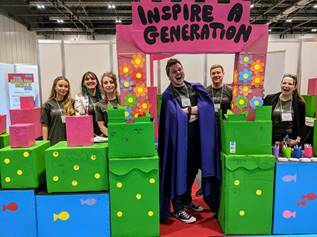 The workshops make the content relevant to children by linking it to classic films such as Oliver Twist and Aladdin, whilst maintaining the integrity that these issues need. Now, Just Enough are looking for children aged 4-12 from the Kirklees area to be nominated for the award. Every day children across the area undertake amazing, selfless acts. The organisation, which has run workshops at primary schools in Kirklees on challenging social issues – reaching 300 children – will award one such child with a £1,000 cash prize. Applicants must be nominated by a school teacher for this national competition by the deadline of Friday 15 February. Just Enough recognises children are the future and speaks to them – in language they understand – about real world issues that will impact their futures. Phil Knight CEO and Founder, said: “At Just Enough, we see remarkable children every day in our workshops. “They do a brilliant job of understanding matters some of the world’s biggest politicians are yet to sort out! “We also see so many examples of children undertaking kind and generous acts – not for reward or recognition but because they want to. Just Enough is encouraging teachers in Kirklees to nominate pupils in their school who have done something amazing. 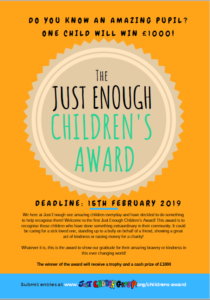 The nominated child must be in primary school, aged between 4 and 12 and the deadline for nominations is Friday 15 February. Finalists will be announced in March before the winner is revealed in April. The winner of the award will receive a trophy and a cash prize of £1,000. A dream trip, a treat for their classmates, or banking it for future – the cash prize can be used however the child wishes to. Just Enough will be checking back in a year to see how they choose to spend the money! Do you know an inspiring pupil, aged 4-12 years old, who goes the extra mile to put a smile on the faces of others? Previous post Thousands of pounds donated to GoFundMe campaign for Almondbury schoolboy racially abused by bullies Next post Coming soon from Kirklees Local TV: ‘ACE’ magazine!